The objective of this lab is to combine gates, a truth table, and a data selector to implement a typical logic function. 1)	Q:	If there were no output from the data selector no matter what the inputs were, even if they were correct, what check should be made first? A:	The voltage at the strobe, it should be low. 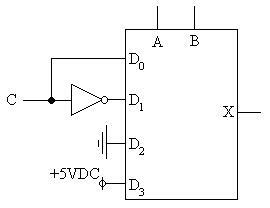 2)	Q:	What is the Boolean expression for the following circuit? 3)	Q:	What are the advantages of using two eight input data selectors or one sixteen input data selector to implement a five variable expression? 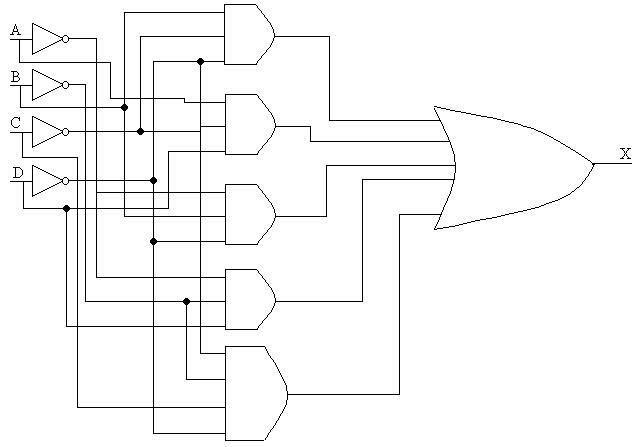 A:	The advantage of using eight input data selectors is that the connections would be easier to make because there would be less pins, while the advantage of using a sixteen input data selector is that the circuit would be smaller and consume less power because there are fewer components. 5)	Q:	Create a Karnaugh map and circuit using conventional gates to replicate the football game. 6)	Q:	What is another name for the data selector? 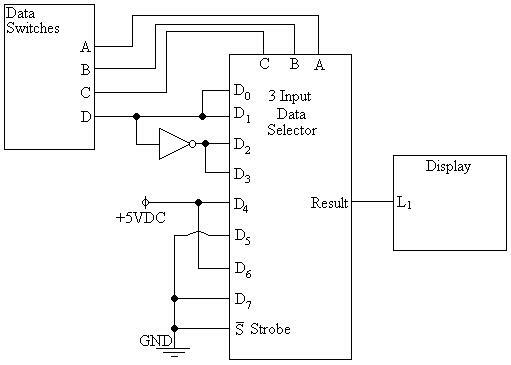 7)	Q:	When troubleshooting a data selector the D0, and D4 inputs yield the same results. As do D1 and D5, D2, and D6, and D3 and D7, what selector input is at fault? A:	In this situation, the C input, or MSB is at fault. From this lab one can conclude that multiple complex logic functions can be easily implemented with the use of a data selector or a Programmable Logic Device.